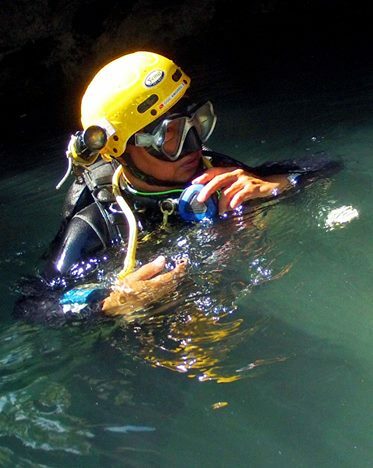 April 9, 2014 April 10, 2014 filipinocavedivers Cool Stuff! The crown jewel of the FCD Siargao Expedition of April 2014 is the discovery of The Inner Sanctum of Del Carmen. 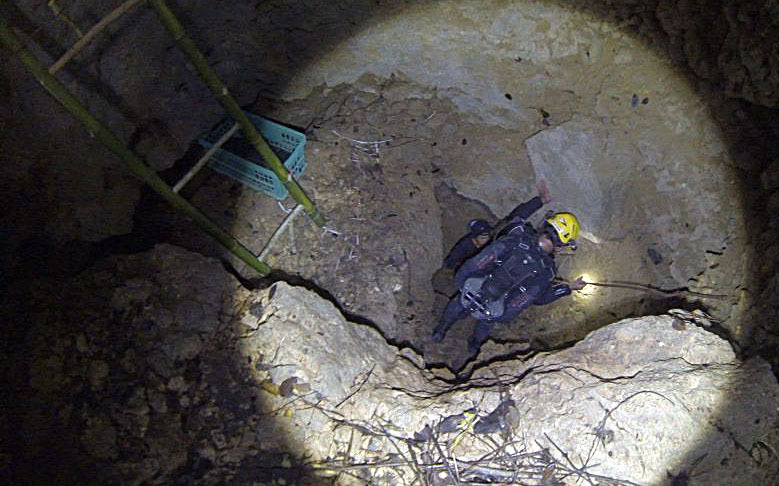 It is a forbidden cave in the foothills near the center of Barangay Tuboran, Del Carmen, Siargao Island. 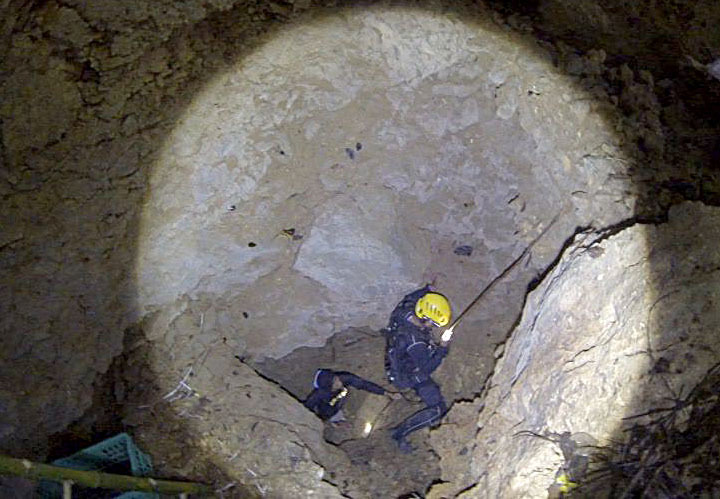 Reportedly nobody has gone inside the cave before this expedition because of the unworldly inhabitants inside – a story handed down for generations. 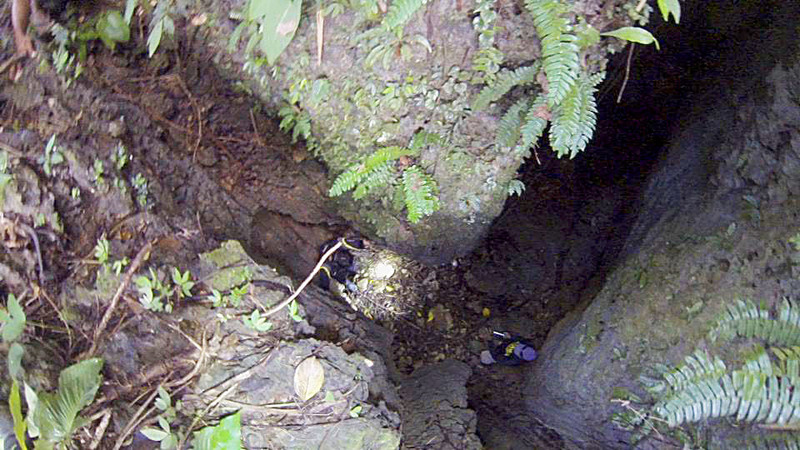 Figure 1 below shows the V-shaped crack on the ground that leads down to a landing about 4 meters below. Fig 1. The V-shaped crack undoubtedly was formed from a violent earth movement thousands, maybe millions of years ago. 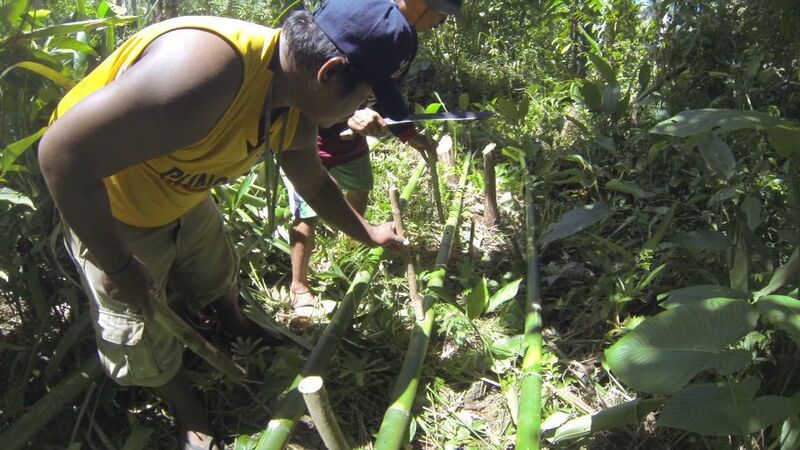 Access to the bottom of the first part of the cave was made possible by bamboo ladders constructed on the spot from bamboos and trees chopped down in the area. Fig 2. The very efficient Kap Randy and his crew constructing a ladder faster than we could say “PLDT lineman ladder”. Fig 3. The ladder to the left is ladder #2 beyond which the rest of the way to the sump is by rappelling. As one can see, half of the fun is getting down to water’s edge. Beyond this, this discovery dive was nothing less than spectacular. As far as the team can recall from all the excitement, the diagram below depicts Del Carmen’s Inner Sanctum (after 1 dive). Fig 4. Baby’s veil are water roots decorating the entrance to The Abyss, a huge chimney that drops straight down to points unknown. 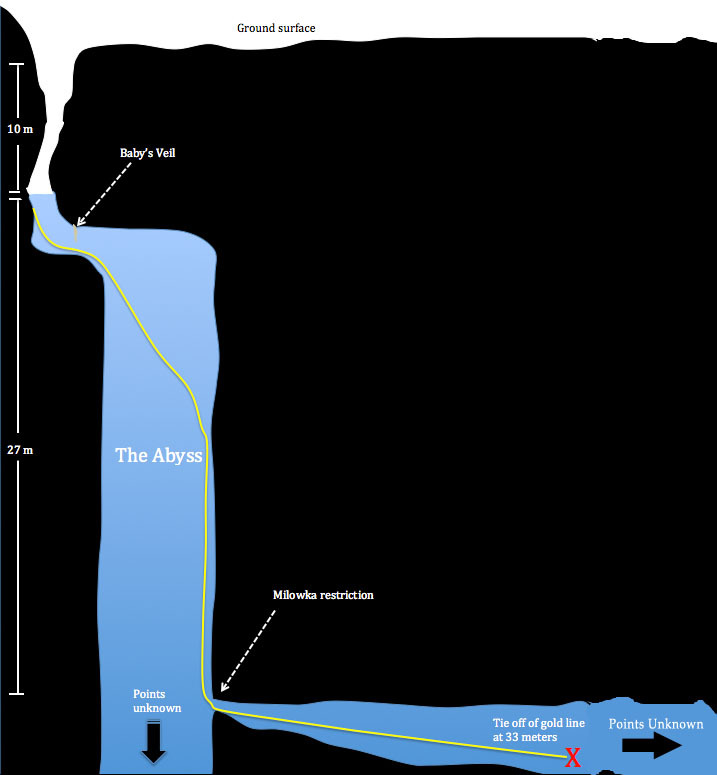 At about 27 meters, Milowka’s restriction, a narrow diagonal crack that leads to passageways and chambers of unknown dimension and extent, was encountered. The dive is depicted in Figure 5 below on the team’s Petrel computer log. Exploration of this exciting underwater cave has just started. Undoubtedly, this will end up as one of the must-do dive destinations in the world. Hon Mayor Alfredo Matugas Coro II of Del Carmen, Hon Barangay Captain Marlon Matugas Coro of Tuboran, Vice Mayor Andie Tan of Del Carmen, the Cubillan clan of Del Carmen, Kagawad Kap Randy of Tuboran, caver-extraordinaire Bartolome “Toloi” Daclan, and the good people of Del Carmen. typo. it has been rectified. thank you for pointing it out.